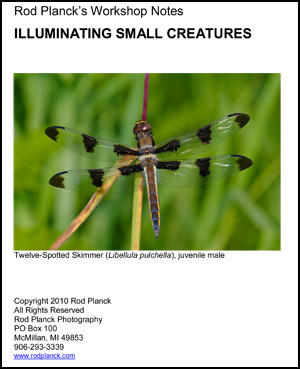 77 Pages devoted to the art of photographing small creatures (insects, spiders, amphibians and reptiles) while using natural light and flash photography. Rod uses stunning illustrations and easy to understand text to explain what can be an arcane subject for many - flash photography. After reading this book and following Rod's step by step instructions you'll be able to go out into the field and photograph free flying creatures with confidence. He'll also explain why flash is not always the best choice and when you should switch back to natural light. Download this beautifully illustrated and written E-book now for only $9.95.